I've made this white chocolate bark many times. Sometimes I'll use pistachios or almonds instead of the pecans. The trick is to use the best quality white chocolate you can since cheaper white chocolate doesn't melt as well. To form little nests of bark, I used a plastic mold that my granny smith apples came in when I bought them at Costco. Instead of throwing the plastic into the garbage, I thought it would make a great mold for Christmas bark. I was inspired by Holly from Phemomenon who used a plastic mold to make a peanut butter bar earlier this year. 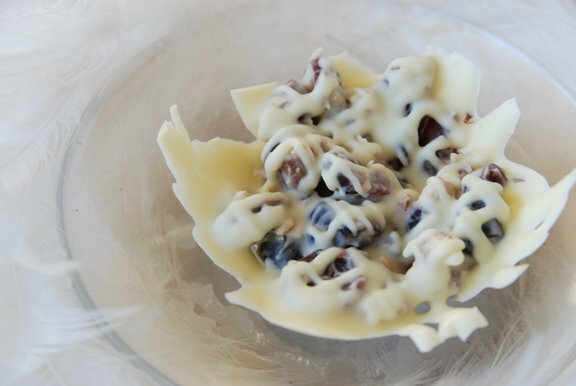 Melt the 3 ounces white chocolate over a double-boiler of simmering water or slowly in the microwave. Stir until the chocolate is smooth. 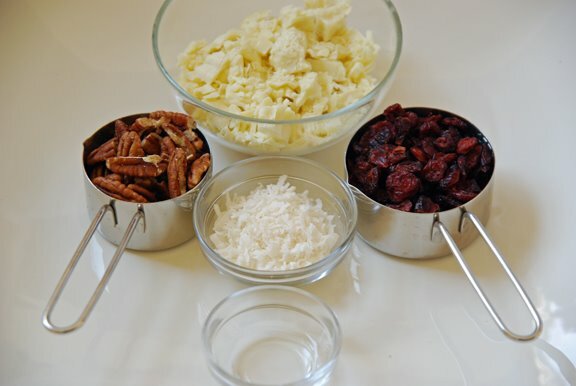 Add the cranberries, pecans, coconut, and almond extract. Drop onto waxed paper or use a mold. 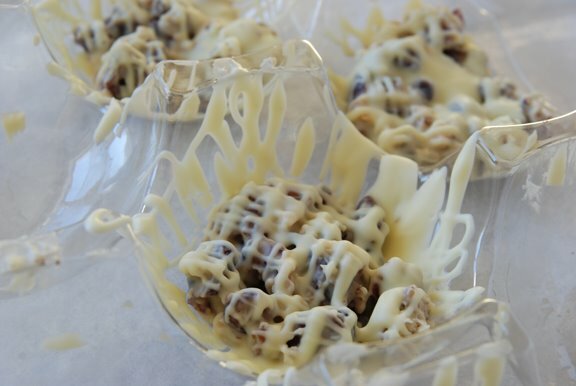 Melt the remaining 3 ounces white chocolate and drizzle in a crisscross pattern using a piping bag. Store in an airtight container. Can be stored in the refrigerator for several months. Ohh, I could eat way, way too much of this. And it's beautiful to boot. Thanks for the recipe! it's so pretty! I love the way you shaped it! While I try to cram those plastic containers into my recycling bin, here you go making something so amazing! Awesome! That's what I am talking about! White chocolate. Holy Yum! Wow Shari this looks so good. Christmas is so full of excesses, I love it. I like the way you gave your bark a unique shape - great idea! Those are very elegant and simple Shari! Wowie, I love the idea of using all that wasteful plastic for something as cool as this. I made this bark, or something quite similar and just cut it in chunks, next time, I am using the left over plastic. Brilliant, absolutely brilliant! oh these are dangerous!i could overeat on these! Coconut at Christmas time is not something you see at all enough of. Great idea to use those apple holder to mold your bark. Very creative! So pretty, they look like little leaves! Just came across this post. 1) Love the name of your food blog, it's perfect! 2) LOVE the idea of using the Costco apple containers as a mold! I just threw one in recycling this morning. Next time!